Of course I wanted to go to Syria. When a big story like this shows up, I believe my job is to go there and produce pictures. I gave up going to cover the Olympics. It was two days before my trip to London and I changed my ticket and went to Syria instead. I have been covering conflict for many years, since the Balkans in 1991. 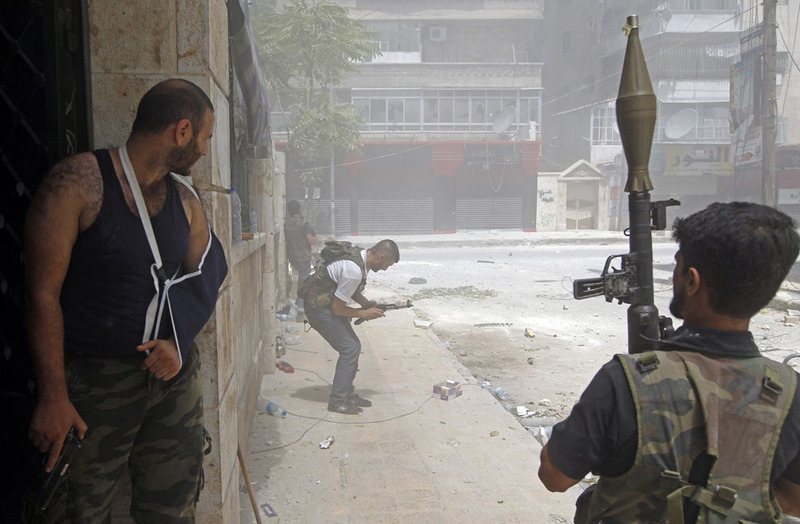 Pictures must show the reality of the war in Syria and that's why I wanted to be as close as I could to the fighters to the very front line to show exactly what they are doing, their emotions, how they run and fire weapons and also how they react to incoming shells. There is a certain amount of risk and you need to take all necessary precautions but if you want to do tell the true story, you have to be there. We organized everything before entering Syria so members of the Free Syrian Army were waiting for us on the other side of the border. As soon as we crossed we went to a farm which was the rebel base where Arab-speaking journalist Hadeel Al Shalchi spoke with the local commander. 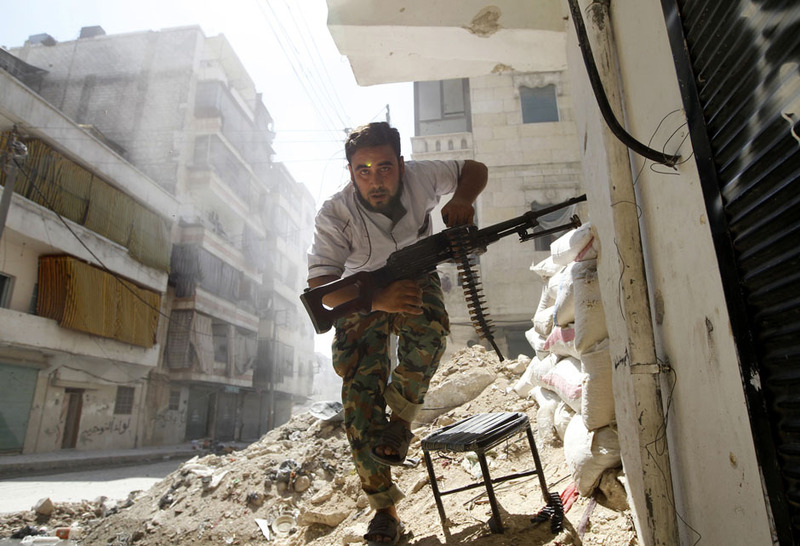 On the same day that we crossed the border we managed to get to the front line in Aleppo. 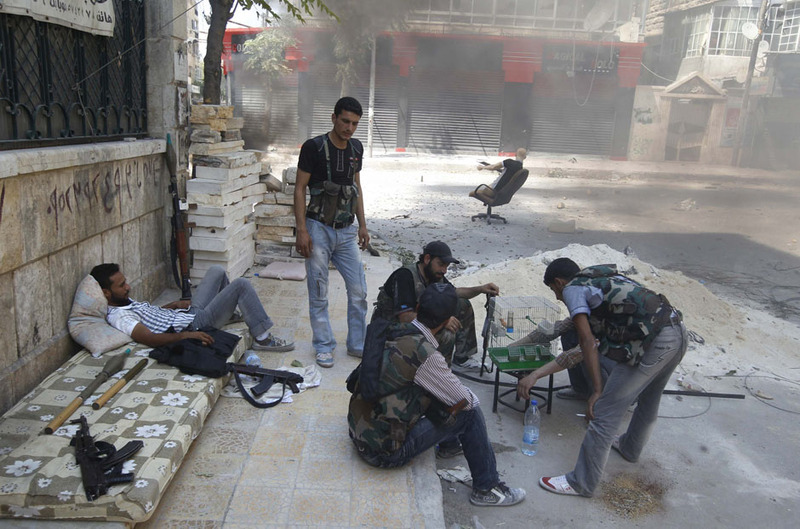 The Free Syrian Army is organized and knows what they are doing. 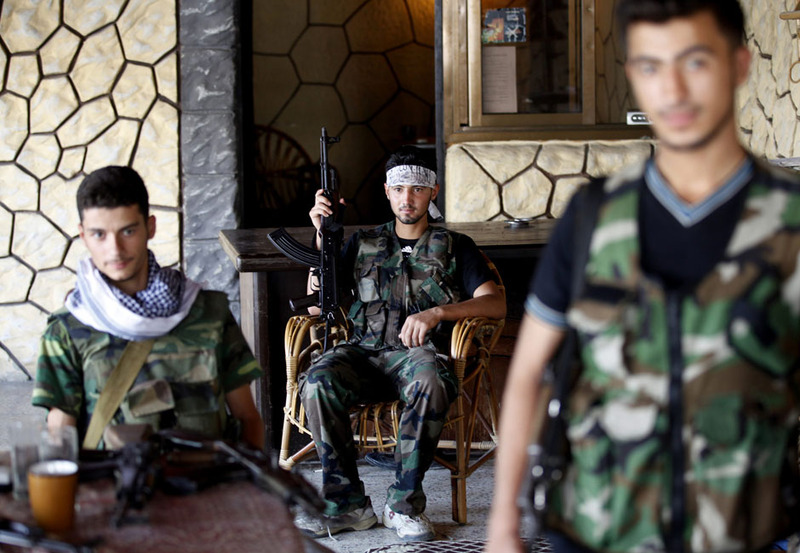 Some members are former Syrian soldiers who defected but most are young civilians, some 16 or 17 years old. They are fighting the Syrian Army with small arms and RPGs and without many supplies but somehow they set up a supply line to get fuel for their vehicles. They are also media friendly. At first they noticed my presence and were a little bit suspicious but after a while they began saying "Goran come here", though they didn't really speak English. They would tell me what missions they were conducting or show me some positions and ask if I wanted to join them. It's difficult to just jump straight into photographing in an unfamiliar city. Often you are a little bit lost but somehow we ended up in the Salahuddin neighborhood of Aleppo, which was definitely the front line, just a few streets away from the government position. On August 4th I witnessed a rebel's death from a very accurate Syrian army sniper who found a hole in between sandbags and fired. The sniper shot him in the chest. I think the bullet went through his heart, killing him instantly. I could see the exit hole on the left side of his shirt. I just ran (fast) across the street and took the pictures in really bad light with strong highlights and dark shadows. 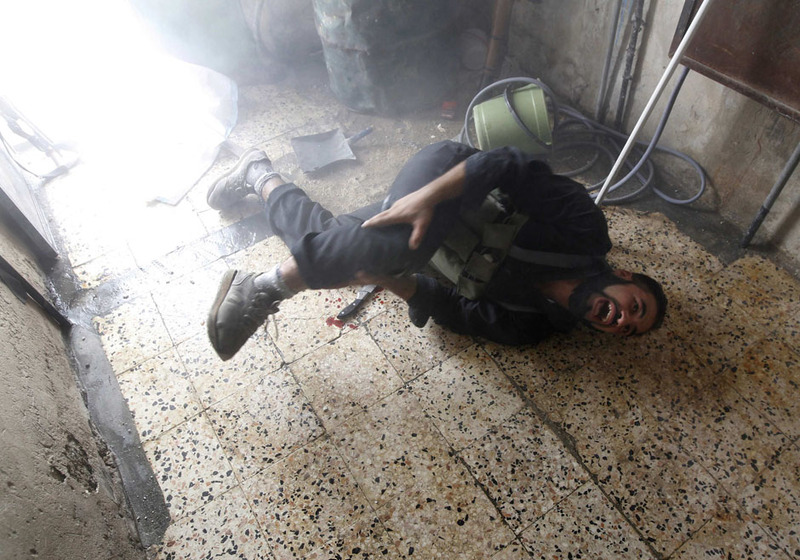 This rebel was definitely someone who was close to the fighter who'd been shot. He was in bad shape and crying, so I couldn't really ask him any questions. 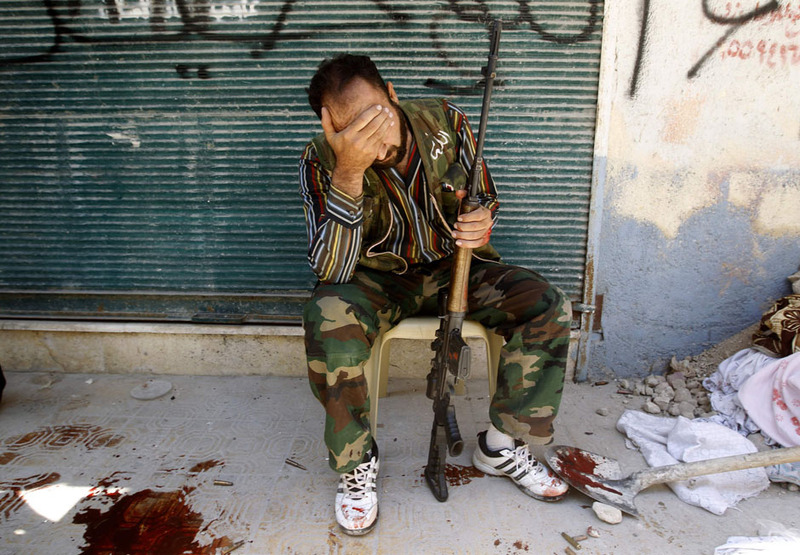 This guy was shooting at the Syrian army and he started to get really accurate sniper fire. One second he was firing and then he just pulled back into my position safe from sniper fire. He just passed by me so he could get into the secure position. I was next to him, on the ground, and shooting with a 20mm lens.. The rebel has a yellow dot on his forehead, which I think is some sort of mirror effect from my lens. On the same day we were just talking on the street when we heard shooting and started running into the building. We heard a large explosion and that is when the rebel was hit by shrapnel. He and others entered the room and I was in a little bit of shock and took some out of focus pictures. It was such a small room with not much light that I had to push the camera up to 3000 ISO. I couldn't see much because there was a lot of smoke. It was really difficult technically to take these pictures. Beside the rebel there is a knife on the floor as people had just been eating lunch in the room. Local rebel commanders told us that if they approached the front line there was heavy tank fire, machine gun fire, mortar shells and sniper fire so they didn't want to come close to the Syrian army. 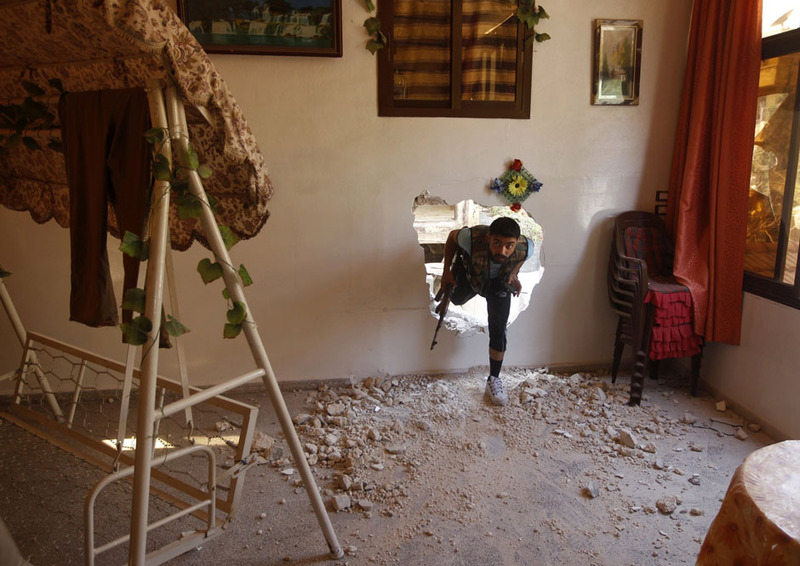 They started to make holes inside the buildings, inside the walls, inside the gates and the fighters would sneak into the houses. They made holes in the buildings to avoid the streets and to be able to go from one house to another to another. Sometimes, I saw some families coming back to take some goods from their homes but most of the time the houses were empty, abandoned as the families sought refuge. 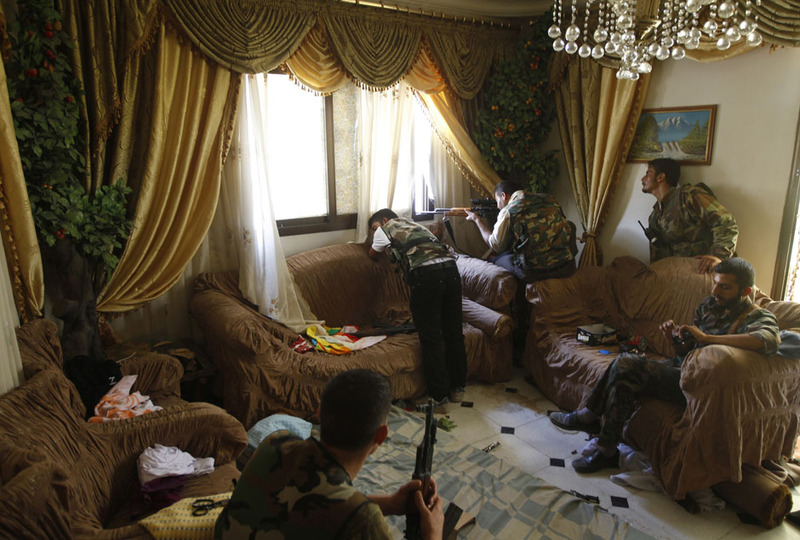 I like these pictures where some fighters took position in a family living room. One rebel sat on the chair eating a chocolate bar as the commander looked out the window to scout the area beside a rebel firing from the window. They told me it was a former Syrian army position and they had killed three soldiers in the house (I could see tracks of blood in the corridor) and taken over their position. There was no one else in the house, except the rebels. One woman came back with her husband to take goods from her house. 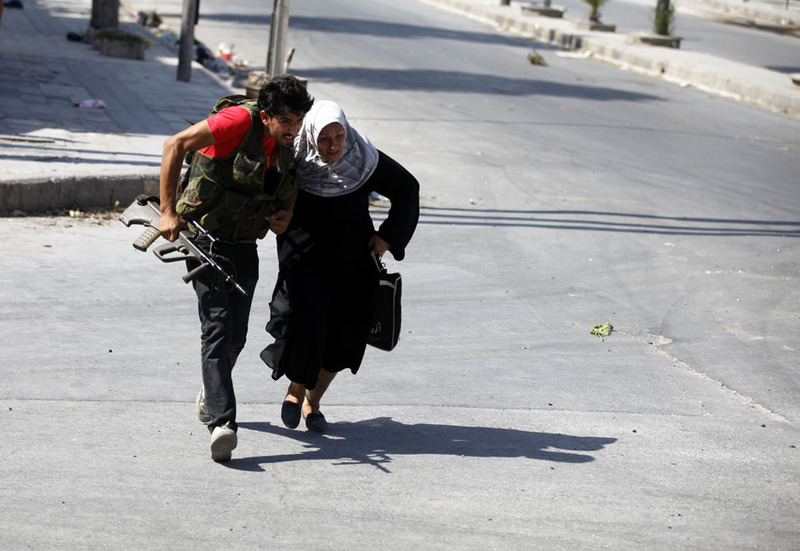 Some of the Free Syrian Army fighters told her that she shouldn't go but she ran across the street to her house alone. She started to cry and wanted to come back so one of the fighters ran back across the street with her. She was crying as she ran across the street that was under open fire. 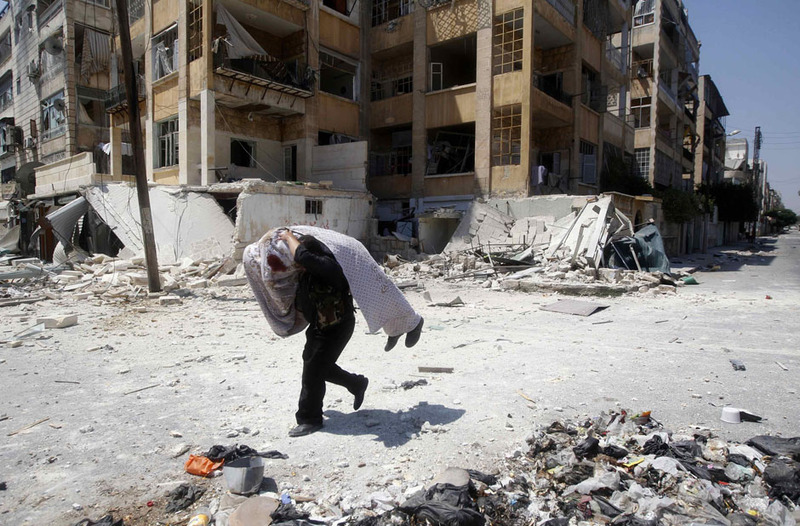 This is one of the many Aleppo streets that you cannot stand on because someone can shoot you. There is a series of three pictures. In the first you can see the tree being hit with the shrapnel. 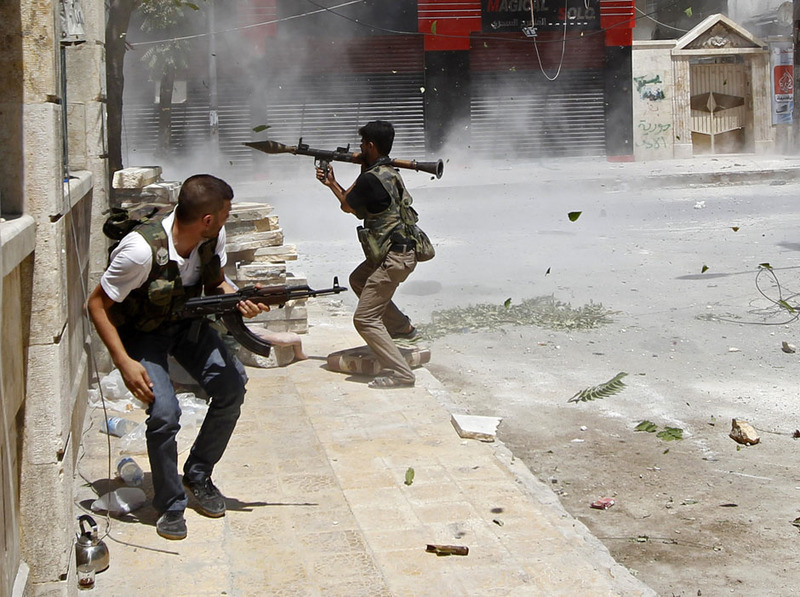 In the second you can see the guy firing the RPG and the third is just after he fired the RPG. All were shot on a 16mm lens. For me, the first one is the most powerful because you can really see the effect of the shrapnel. 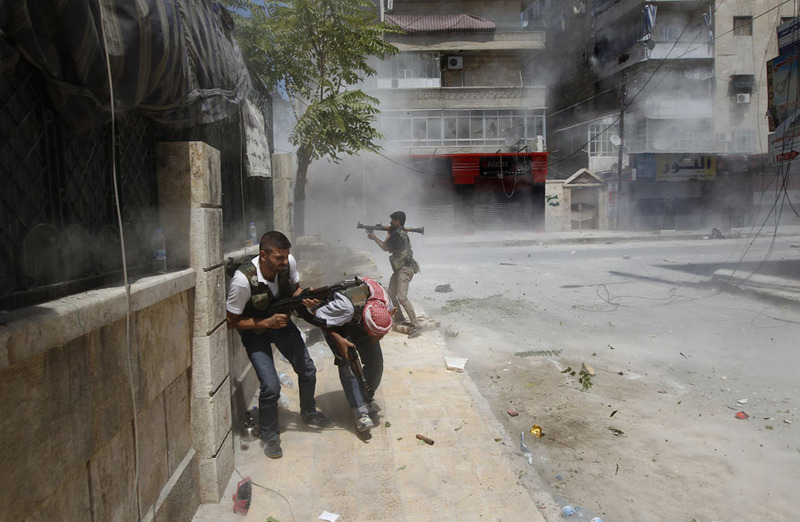 It was a very dramatic situation with the smoke from the tank shells filling the street behind the fighters. A lot of bodies were lying in the streets. 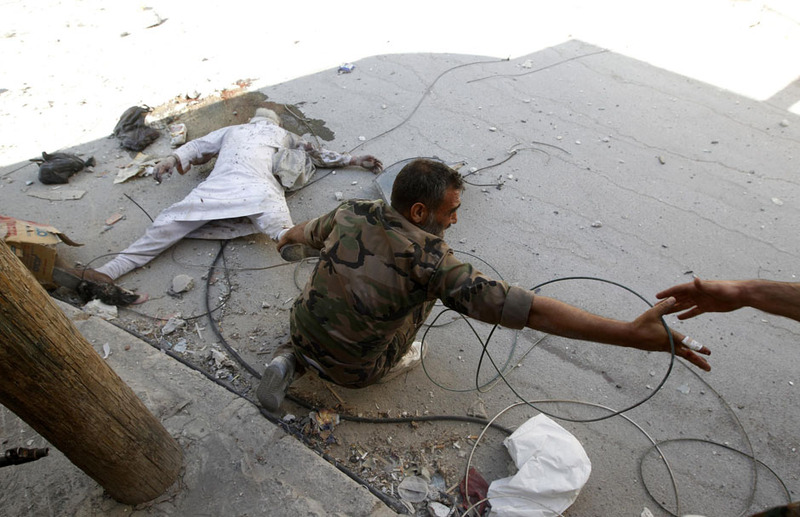 In this picture a civilian shot dead by sniper fire some days ago is rescued by a rebel commander who needed to drag the body out of the line of fire. 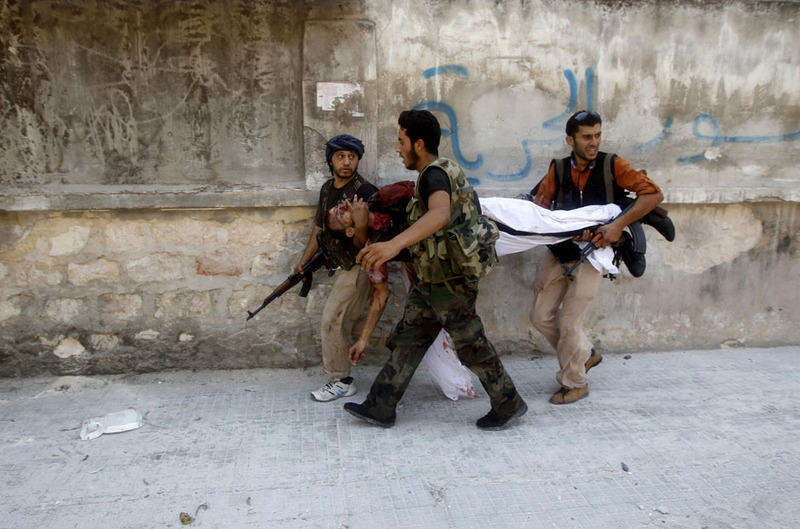 When some of the rebels took over a government position a few of their fighters were killed by government forces. Five rebels decided to go on a rescue mission to recover the bodies of their comrades. I went with them. We were literally crawling for 150 meters. They used a long stick, on which they attached a hook to drag the bodies a few meters off the street and into very narrow alleyways and then carried the bodies through the streets, passing them to one another through the holes in the buildings. The whole process took about 4-5 hours; it was a really long day. The bodies will be sent back to the families. 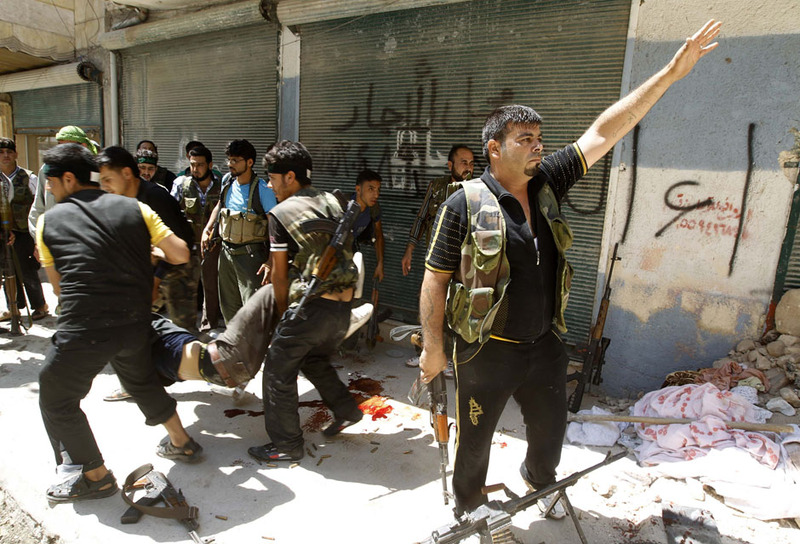 One of the bodies was of the brother of one of the fighters. I can't describe the situations of war. On my last day in Aleppo one of the fighters was walking around and looking into the buildings and he found the bird in the birdcage. He took it out of the apartment. The bird didn't have any water so they put some in his cage. The rebels did some crazy things, like putting this mannequin in the line of sniper fire on the street and then burning some tires where the government forces were firing tank shells. It was kind of funny and scary at the same time. Because I don't speak Arabic, I didn't understand exactly what they were doing. They would be laughing but then you would see the incoming fire and about 60-70 meters away you'd see the tank shell explode into a building. When I'm covering conflict situations, I try to follow the ground and find cover for myself. I pray a lot so that keeps me safe. I can't give any advice. Things are changing with the situation in Syria all the time. Ethiopia and Eritrea: An elusive peace on the cards? Are African governments suppressing art?